Maribor is the second largest city in Slovenia, and I use the word 'largest' rather loosely. With just 95,500 in habitants, the population seems positively sparse compared to, say, Birmingham and its 2.5 million residents. In fact, my first impression of Maribor when I stepped out into the blinding sunshine and fresh Slovenian air was that of a small, sweet, and rustic town - what with its pocket-sized cobblestone square flanked by buildings no higher than 3 storeys (in fact, Maribor Castle is only 4 storeys high) and traffic so sparse I could stop in the middle of a main street to take photos (which I did). From the occassional abandoned, graffitied pastel building; a few faded facades and a patina-ed window shutter here and there, I gleamed a slight 'overlooked middle-child' feeling about Maribor - an opinion not entirely unsubstantiated after a visit to the National Museum of Liberation. The archives of National Museum of Liberation, immaculately presented over 6 exhibition rooms in the beautiful villa that houses the museum, paints a picture of modern Slovenian history. 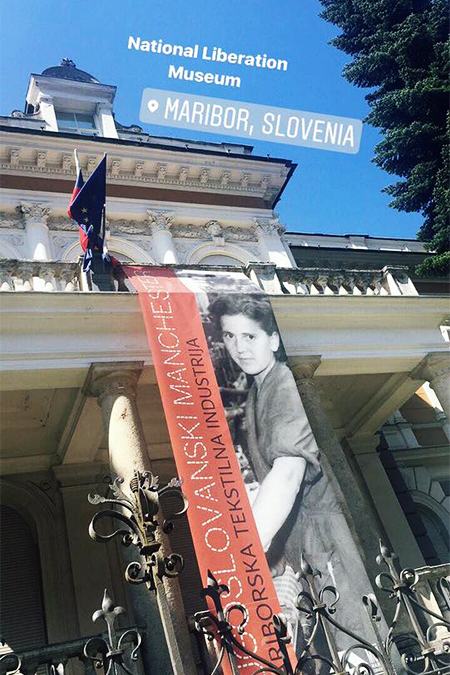 I began with an exhibition about Slovenia's role as "the Manchester of Yugoslavia" for its textile production and weaving, musing about the missed opportunity of nicknaming the country 'Slo-weave-nia'. Hitler: "Make Maribor German Again"
It was after the textile industry exhibit that I moved upstairs to the museum's specialty: its permanent exhibition describing happenings in Maribor during World War II, with material detailing both sides - the fascist occupier and the local partisans. I learnt of how Maribor was an Austro-Hungarian state before joining Yugoslavia, and of Hitler's famous words when he arrived in Maribor: "Make this land German again". The permanent exhibitions of The National Museum of Liberation documents the Slovenian struggle against fascism - from the Nazi's attempts at "German-ising" the Slovenian population, the organization of the resistance, and the operations of the resistance groups and partisan units from 1941 up to the end of the war. The Nazi occupation inadvertently made Maribor the production capital of Slovenia - especially for metalworks - but the city's unexpected status as the country's new industrial centre didn't survive the breakup of Yugoslavia. From my brief glimpse of Maribor it seems that traces of its industrialised past have faded to that of a charming provincial town that is now known for its wine-growing - Maribor is home to the oldest vine in the world. I clambered in and began the drive to the capital - Ljubljana. At a glance, first impressions of Ljubljana is that it is far removed from many people's idea of a 'capital city', that is; devoid of the congestion, chaos, and cacophony that plagues so many European capital cities - especially those renowned for being relatively cheaper to eat, drink, and be merry in (stag parties in Prague, I'm looking at you). Perhaps it's the distinct lack of car traffic. Except for the electric powered kavalirs (a sort of golf buggy) offering free transport around the old town - I admit that I unabashedly hopped onto the back of one to take me a short way to the 'millennial pink' Franciscan Church, only to be mortified when the kavalir stopped in front of a group of senior citizens who were definitely judging me - the city centre is pedestrianised. The only traffic here are the bicycles and the people who ebb and flow along the willow-lined banks of Ljubljanica River. It's exactly what you'd expect of one of Europe's most liveable cities - the first EU capital to adopt a zero-waste programme and the Green Capital of Europe 2016. Seen in Slovenia: the 'Accidental Wes Anderson' pastel pink Galerija Emporium (are those gold letters Futura?!) and its matching neighbour, the Franciscan Church. 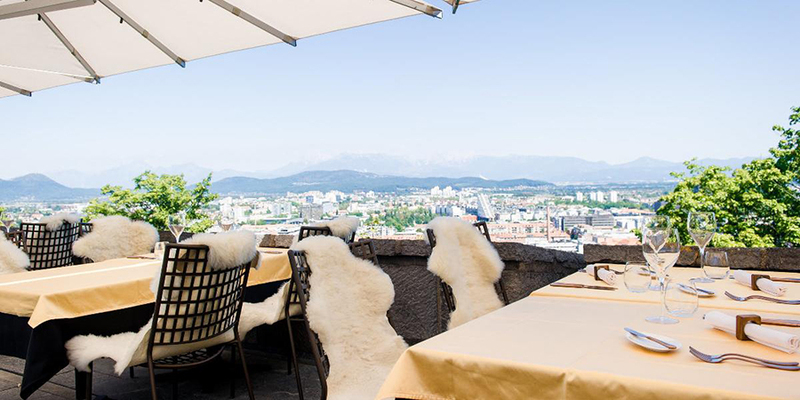 Lulled into a languid stupor by the petite prettiness of the jewel box city, I fell into the honeytrap of initially judging Ljubljana as a lovely but not especially exciting place. It's easy to do so when all I could see were endless cafe terraces alongside the river and bijou farmer's markets selling pots of honey, flowers, and other local specialties. My local guide did describe the Slovenian way of life as laid back, relaxed, and enjoying the simple pleasures of many a mid-afternoon coffee. But when night fell it was a very different story, and one that I regret failing to capture having left my camera in my hotel room before heading out to dinner. In the cover of darkness the city's 50,000-odd students emerge to literally dance in the moonlight - Ljubljana has quite the clubbing scene, and thankfully few of them felt the need to spill out on the pavement in obnoxious drunken stupor. It seems that the city's graceful landscape permeates the behaviour of its residents and many visitors (many of which seem to only come out at night). Happily, a dinosaur like myself has a choice of cultural experiences that doesn't involve the disco - the foodie scene here is burgeoning. 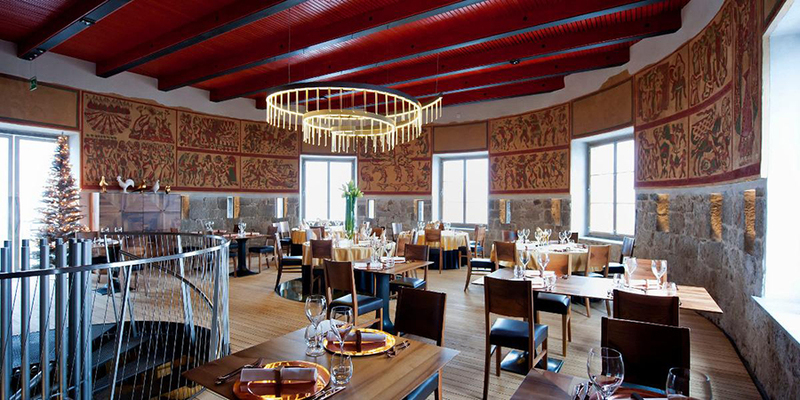 I'm especially keen to dine at Strelec (below) - a romantic, rustic establishment hidden in the city castle’s Archer’s Tower serving up sophisticated Slovenian fine-dining - upon my next visit to Ljubljana.